Aranya is pleased to announce the opening of its third outlet in Uttara. Located at Sonargaon Janapath Road, Sector 9, Uttara, the outlet was inaugurated on Saturday, March 16, 2019. The event was jointly inaugurated by Mr. Abul Khair, Chair, Bengal Foundation, and National Film Award winning actor, and producer Jaya Ahsan. Luva Nahid Choudhury, Chairman, and Nawshin Khair, Managing Director, of Aranya were present at the occasion. Senior officials of Bengal Foundation and Aranya as well as renowned personalities of the country’s fashion and entertainment industries also graced the event with their presence. Through the years, Aranya has grown into a distinguished producer and reseller of products crafted by artisans from across Bangladesh. Aranya Crafts Limited was set up in 1990 as a Fair Trade enterprise with the aim to establish the commercial viability of natural dye products of Bangladesh, create job opportunities for artisans and reinforce handicraft production as a means of empowerment, development for the most marginalized segments of society and promote those products in the mainstream market. Through the years, Aranya has grown into a distinguished producer and reseller of products crafted by artisans from across Bangladesh. The label is known for its high-quality sustainable products, its unique natural dye palette, traditional designs and craft techniques. Many of these products are being exported to international brands worldwide. 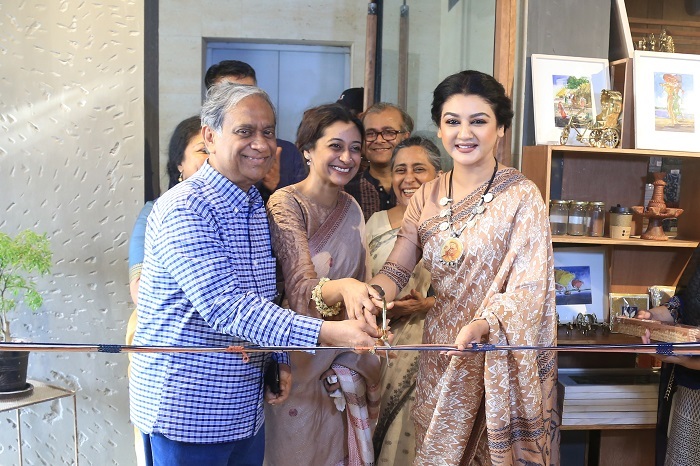 Nawshin Khair, the Managing Director of Aranya reiterated Aranya’s commitment to their artisans as well as the environment and expressed her satisfaction in seeing a growing awareness of sustainability, as well as a growing demand for Aranya’s products, which actually led to the opening of the Uttara branch. Aranya’s new and festive line designed specifically for Pohela Baishakh will be available at their new outlet at Level: 3, Plot 60, Sector: 9, Sonargaon Janapath Road, Uttara, Dhaka-1230.